Amy surrounded by those who wrote Employee of the Year nominations. Photo by Steve Gooch. I was surprised and honored when the zoo awarded me as Employee of the Year. 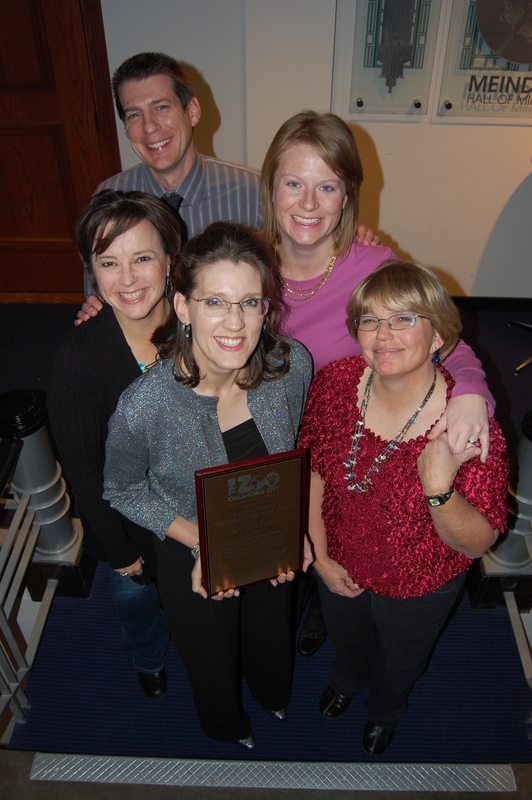 Four lovely people wrote nominations: Todd Bridgewater, Tara Henson, Teresa Randall and Candice Rennels. 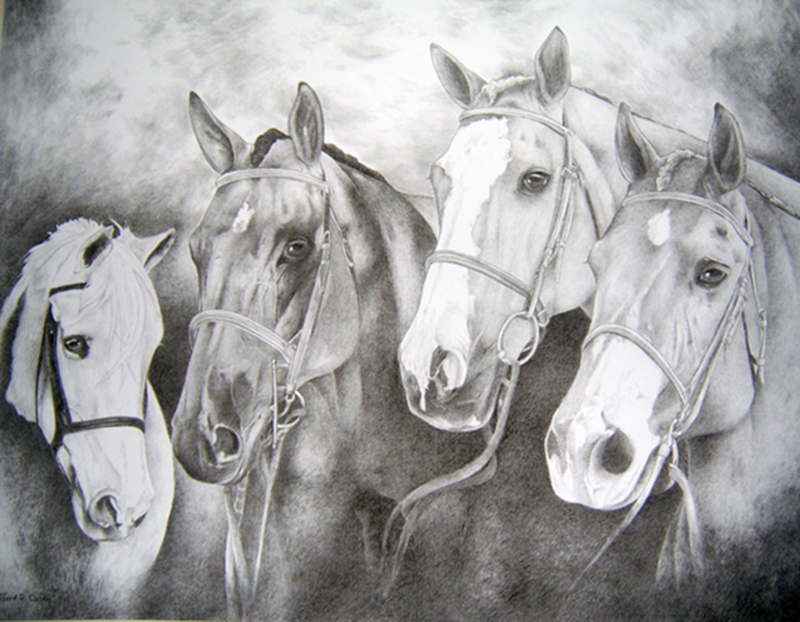 I cherish each of them and will always be grateful. With permission, I’ve included Todd’s nicely-written nomination, followed by the zoo press release. Amy Stephens’ enthusiasm and passion the Oklahoma City Zoo’s history is nothing short of contagious. Her research connects the zoo’s growth to significant events in our community. It covers everything from animal behavior and husbandry, construction and exhibit design, civil rights and political figures, community and culture, and two once forgotten beer-drinking monkeys. Even though it was beyond her scope of duties, Amy dedicated the past 8 years to salvaging and archiving 108 years of zoo history. She first excavated the Daily Oklahoman archives for stories of Wheeler Park and the Lincoln Park Zoo. This yielded enough material to fill twelve D-ring binders and publish two books: Oklahoma City Zoo Now and Then and Oklahoma City Zoo: 1902-1959. Additional articles further revealed her gifts as a talented writer and story-teller. 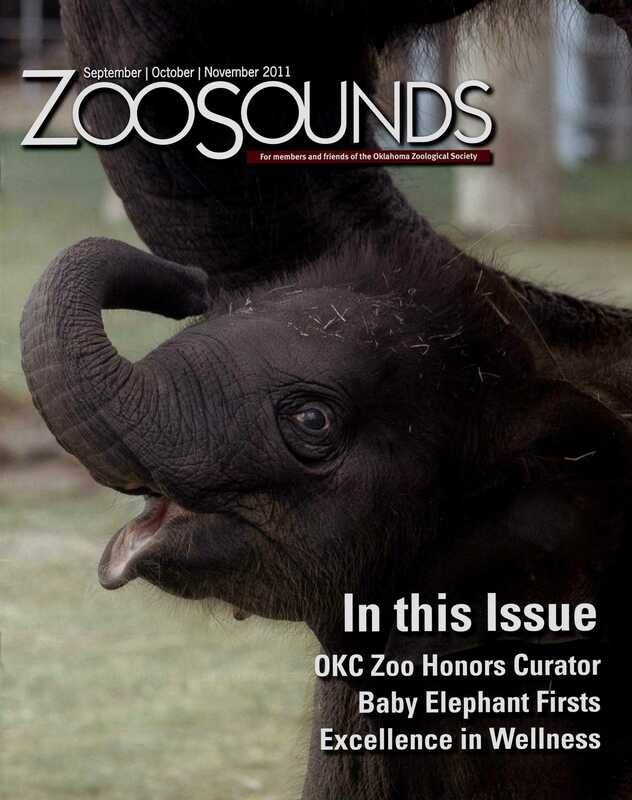 She imparted the significance of our zoo’s history to the community, state and the global profession by respectively publishing articles for ZooSounds, Distinctly Oklahoma and NAI’s Legacy Magazine. 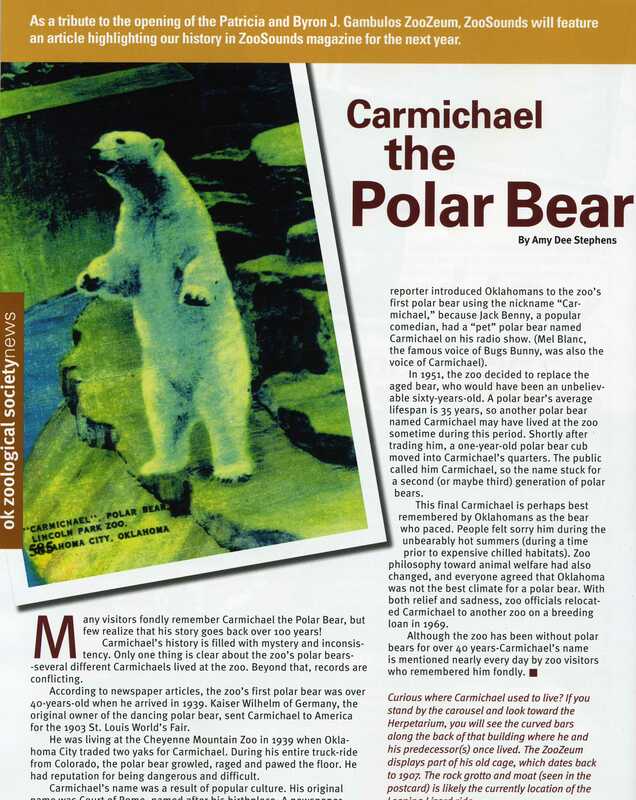 In short, these publications became stepping stones to sharing the Zoo’s rich, and often humorous culture, in person. Amy and Mike at the ZooZeum grand opening, April 9, 2011. Photo by Lisa Franks. Amy presented many programs to community groups (i.e., Rotary, Edmond Newcomers Club, Daughters of the American Revolution, Red Hat Ladies, Ladies Auxiliary, etc.) about the zoo’s first 50 years. Several of these occurred on her personal time; however each benefitted the zoo. Her presentations increased our community’s awareness of, interest in and donations toward the overarching goal of creating a formal zoo museum. Note – it is extremely difficult to measure the effect of a specific program on someone’s attitude. In this case, one only needs to look at the zoo’s archive collection. Its growth is a direct reflection of her personal commitment and activism in saving zoo history. Current and past employees, as well as public citizens, donated numerous personal and historical affects producing a unique and diversified collection (i.e, articles, postcards, video, slides, t-shirts, artifact, etc.). Sixteen individuals even contributed their life stories through a recording project with the Metropolitan Library System. Volunteers have spent more than 800 hours cataloging over 6,000 items, with more waiting to be processed. Overlooking the 80-year-old bathhouse that is now the ZooZeum. Photo by Todd Bridgewater. Opening a museum requires vision, creativity and an ability to communicate both with clarity. Amy’s management style ensured that everyone stayed informed and involved. By working with multiple zoo departments, she guided a renovation process that turned a 4,000 sq. ft. dilapidated building into a beautiful exhibit space. Appropriately named the ZooZeum, the building features two exhibit galleries with museum quality cases, oversized graphic panels, multimedia presentation platforms and more. Her attention to detail not only included aesthetics, but extended to infrastructure too. Amy began researching and developing an archival storage system from scratch, which is now accredited by the American Association of Museums. After the ZooZeum opened, Amy’s work shifted from individual stories to envelope the site itself. She created two to behind-the-scenes programs and organized five on-site special events. She also presented the ZooZeum at three conferences, including an international on-line audience, and three podcasts. 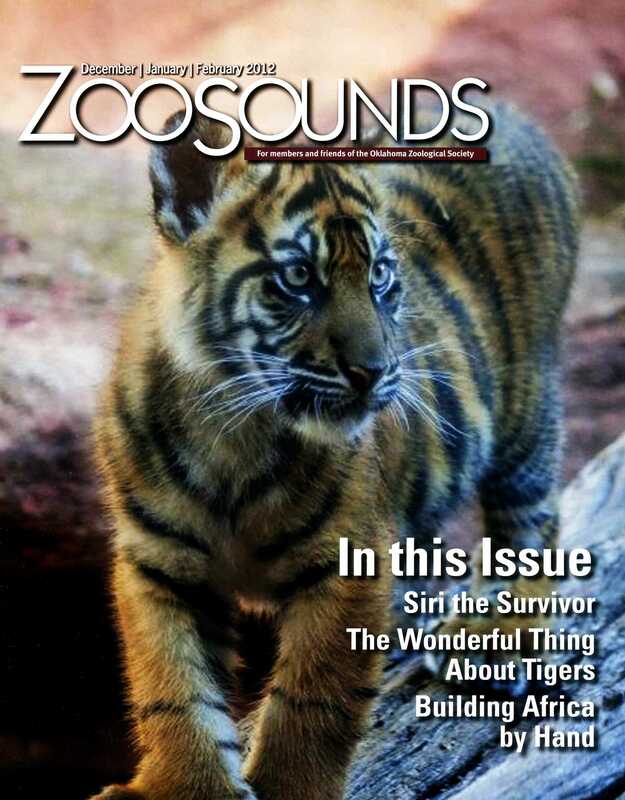 Each program, event, conference and podcast succeeded in achieving zoo education’s primary mission – connecting our guests with zoo resources. At a recent meeting in Saint Paul, the education staff from the Lincoln Park Zoo raved about Amy’s ZooZeum presentation – from three months ago! They have spoken with her since, are still in awe and clamoring to do the same at their site. As far as we know, there is no other zoo exhibit like the Patricia and Byron J. Gambulos ZooZeum. It is unique and one-of-a-kind. It is also interesting to think how saving an organization’s history can be viewed as a progressive step forward. Amy Stephens not only guided that process, she inspired others to join in the vision, to donate their personal affects, to give their time, and to become stewards of their own resources. The ZooZeum presents memorable stories of our organization’s growth within the context of our community’s history. She answers to the unofficial title of Zoo Librarian, but perhaps a more fitting one is Zoo Historian. We should honor Amy Stephens’ passion and commitment to the Oklahoma City Zoo by recognizing her as Employee of the Year. 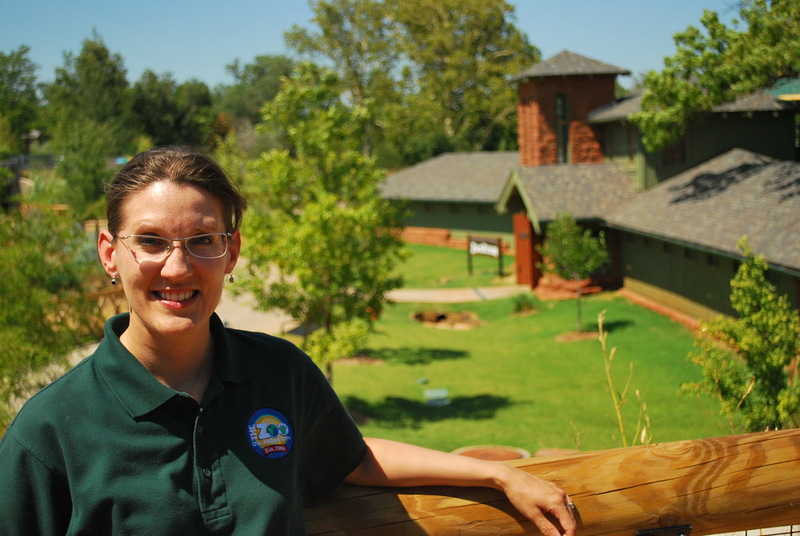 (Press Release) The Oklahoma City Zoo and Botanical Garden proudly announces Amy Stephens, Naturalist Instructor Supervisor as the 2011 Ralph D. Harris Employee of the Year. The Employee of the Year award is selected each year by the Zoo’s Employee Recognition Committee and management staff. 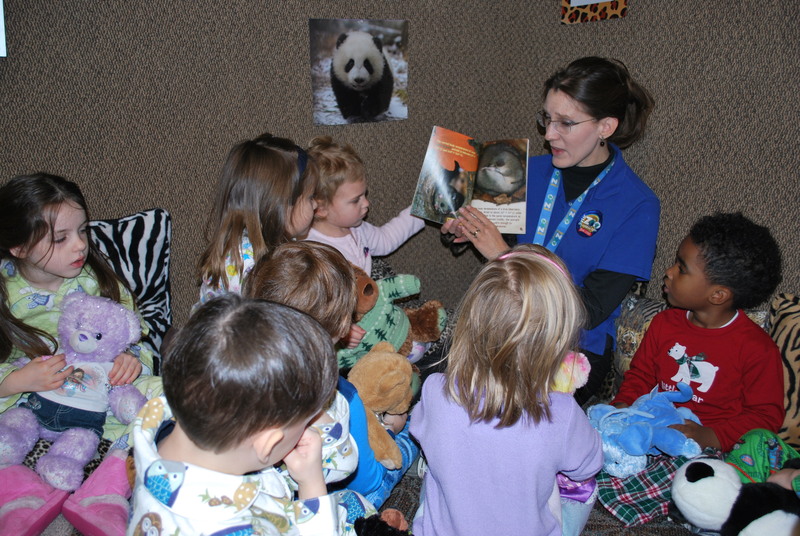 Amy teaching zoo preschoolers. Photo by Todd Bridgewater. A member of the Zoo’s Education team since 1998, Amy teaches a variety of programs throughout the year in addition to supervising the department’s part time birthday party, snooze and camp staff members and overseeing the Zoo’s collection of historical artifacts. 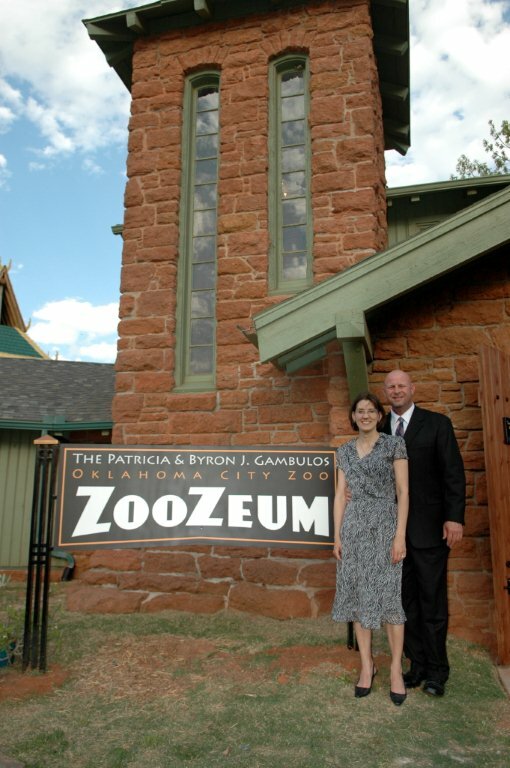 Amy was the sole impetus behind saving the historical building that is now the Patricia and Bryon J. Gambulos ZooZeum. Through her passion and motivation to preserve the Zoo’s history for generations to come the foundation for the ZooZeum came to life when it opened last spring. 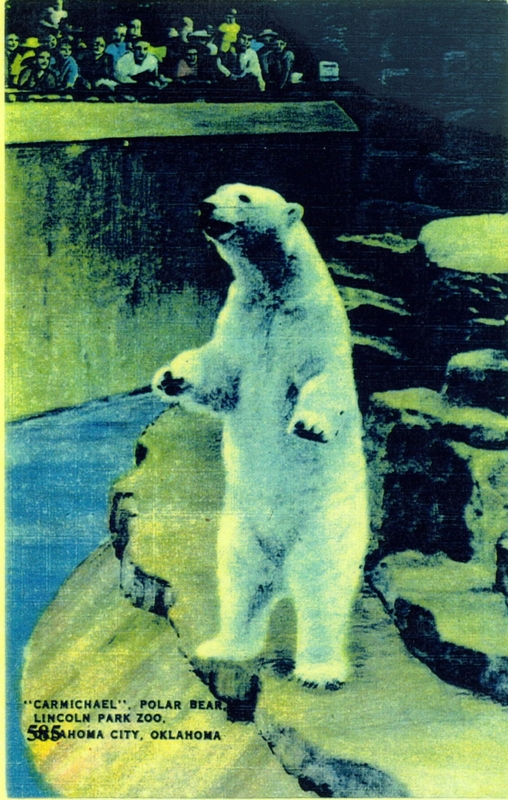 For nearly a decade Amy gathered historical information, objects and oral histories about the Zoo. This past November her effort to bring Gayla Peevey to the Zoo for the debut of the “I Want a Hippopotamus for Christmas” ZooZeum exhibit resulted in providing a special holiday event for the community and creating another unforgettable moment in the Zoo’s history. Amy brings many of her personal passions to her job. She supports animal welfare and co-developed the Zoo’s internal certification program for animal training and its curriculum. An advocate of life-long learning, Amy shares this passion with staff and volunteers by maintaining the Zoo’s library. Working closely with staff she keeps the library’s collection current allowing them access to information on present zoo practices and research. She is also an engaging speaker and often speaks in public forums about the Zoo. Aside from her Zoo duties, Amy is an award-winning author. Her book “Oklahoma City Zoo: 1902-1959” (c2006 Arcadia Publishing) was awarded as an Outstanding Publication by the Oklahoma Museum Association. 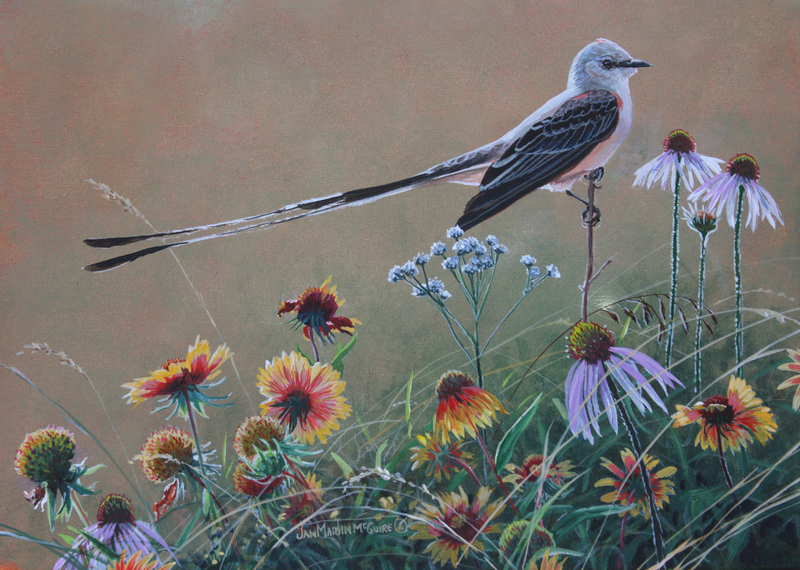 She also maintains membership in with the National Association for Interpretation and the Oklahoma Museum Association. Amy earned a bachelor’s degree in Elementary Education from Oklahoma Christian University and a master’s degree in Instructional Media from the University of Central Oklahoma. 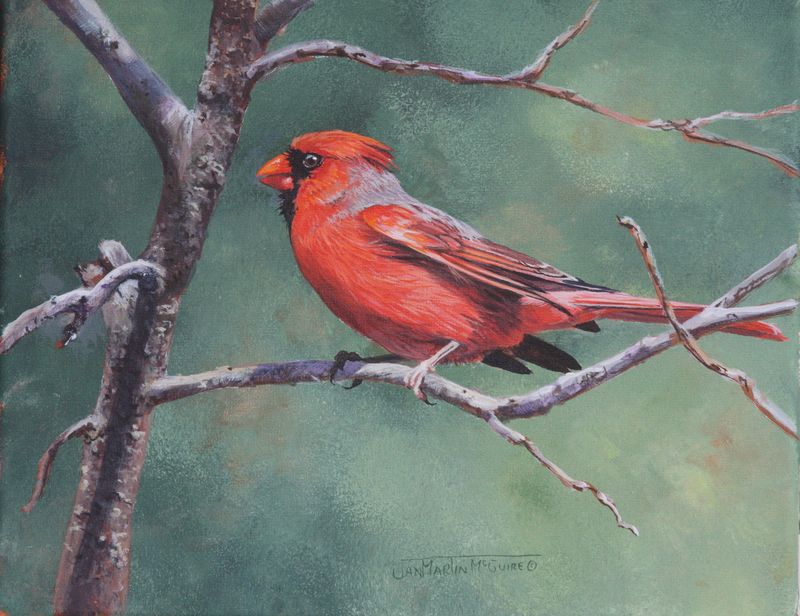 She and her husband Mike reside in Edmond, Oklahoma. “Whew,” responded the primate staff. “Whew” because they only realized that the mother chimpanzee was pregnant about 6-weeks before delivery. This was not a faulty oversight…it was shock! No one dreamed the 56-year-old female was still of child-bearing age. 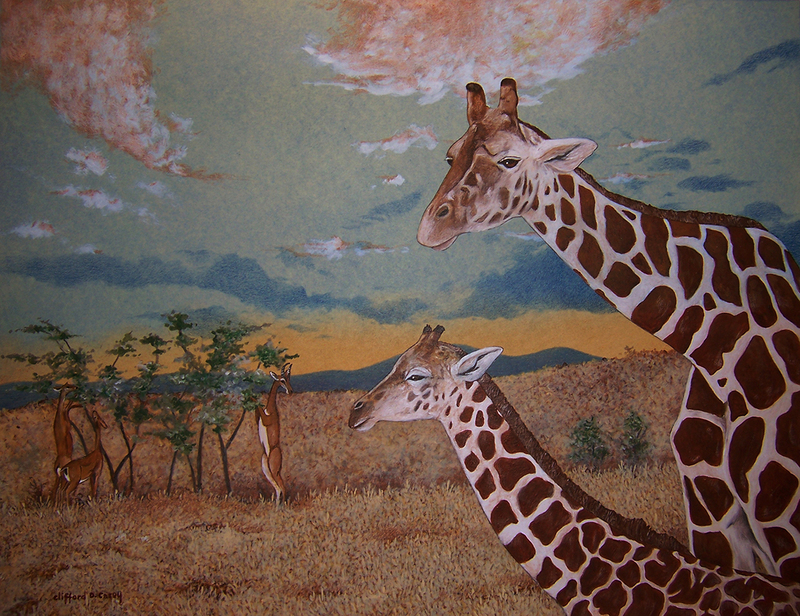 The mother was very attentive, protective and nursed regularly. But seven months later, it was clear that something was wrong. Siri was still tiny. Testing revealed that the mother’s milk lacked the nutrients of a younger female, and Siri was starving. After diet modifications failed, Sunset Zoo asked the Chimpanzee Species Survival Plan for help. Oklahoma City Zoo was selected as the facility equipped to accommodate Siri’s needs. Just two years ago, the Great EscApe team successfully hand-raised and introduced baby Zoe to their troop. When Siri arrived inOklahoma City, she was 8-months-old and just 3 ½ pounds. Genetic tests, donated by Harvard, revealed the surprising news that other than malnutrition and lack of muscle mass, her organs were working fine and she had no mental disabilities. For the next four months, Siri had 24-hour care. 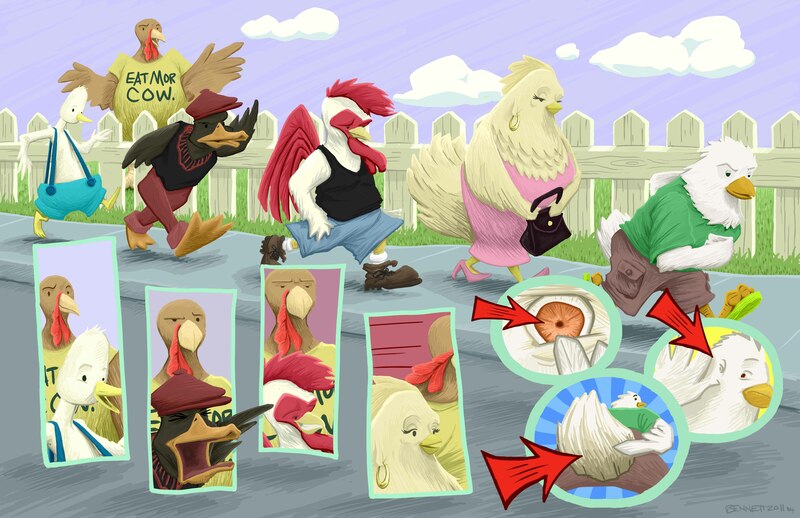 Staff and volunteers initially had one focus—feed that baby! It wasn’t as easy as it sounds. Siri had no interest in food; staff described it as an aversion to eating. A feeding tube helped her get calories, but the challenge was to teach Siri how to feed herself. To complicate matters more, a troop member unintentionally injured Siri. 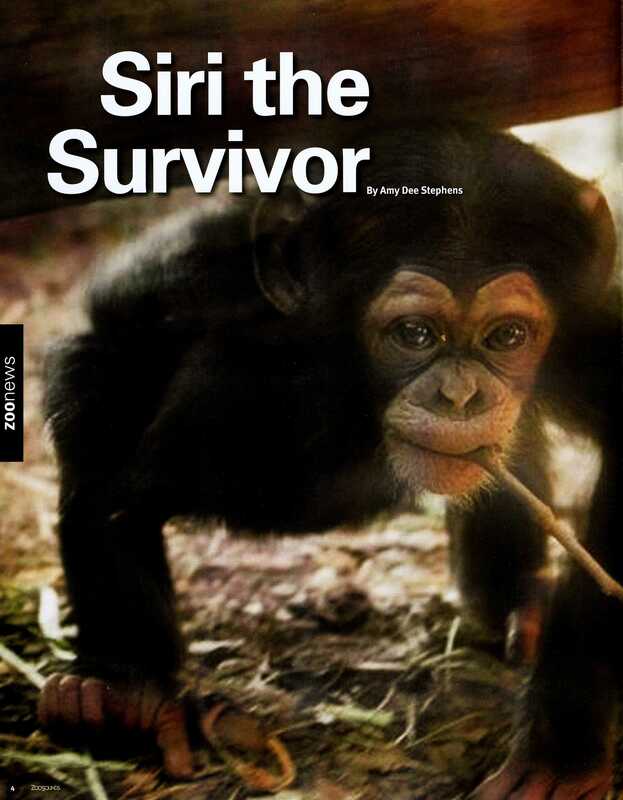 Siri reached toward a chimp through a 2-inch gap in the mesh that separated her from the adult chimps. A female grabbed Siri’s arm and it detached at the elbow. As Siri’s strength improved, the staff began physical therapy to help her overcome her missing forearm. Climbing on a jungle gym made of PVC pipe and ropes helped Siri build muscles, balance, and learn to rely more on her feet. Teaching Siri independence proved to be the hardest feat for staff, however. When it was time for Siri to meet her new chimp family, staff again had to practice tough love. Introducing chimps is risky in a regular situation, but trusting tiny Siri with an adult was nerve-racking for the staff. Fortunately, they knew the troop well enough to have several backup plans. Chimp introductions begin with one member at a time. If all goes well, the two chimps spend time together to build up trust, and then another chimp is added into the mix. The primate staff had three female chimps in mind who might make a good surrogate mother for Siri. Introductions to Cindy and Abby went fine, but neither seemed to show interest in nurturing an infant. The third female, Kito, went right over to comfort Siri. Newby said she had “the baby instinct.” Ironically, Kito was the very female who injured Siri’s arm in an effort to reach her through the window. Since then, other troop members, including Mwami, the dominant male, have met Siri. Despite some of the usual “family politics,” the introductions have gone well and eventually all eight chimps will be on exhibit together. Zoe and Siri play so actively together that most people don’t even notice Siri’s missing limb. Three times each day, Siri drinks a bottle of infant formula through a customized mesh hole at the building. She is never expected to be large chimp because of her early nutritional delay, but staff are proud to say that she is independent, playful and acting like a normal chimp. Four frolicking balls of fur exploded onto the scene of CatForestthis fall. Tiger cubs, Leonidus, Leeloo, Lola and Lucy pounce, roll, stretch, and explore…providing visitors an action-packed experience. But the scene was quite different when these four cubs entered the world. Calm and peaceful best describe their first days. 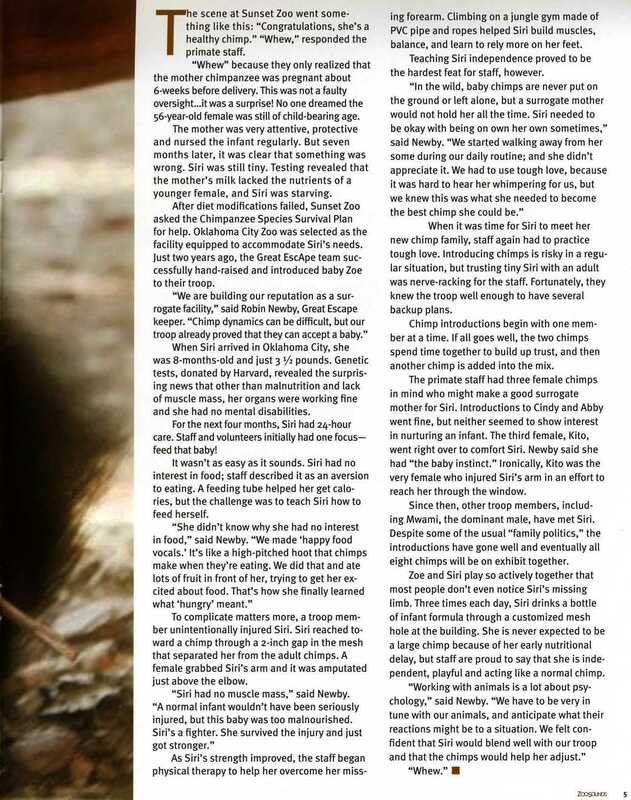 “About ten days before we expected the mother, Suriya, to deliver, we moved her indoors to a special birthing stall,” said Jonathan Reding, Cat Forest/Lion Overlook Supervisor. 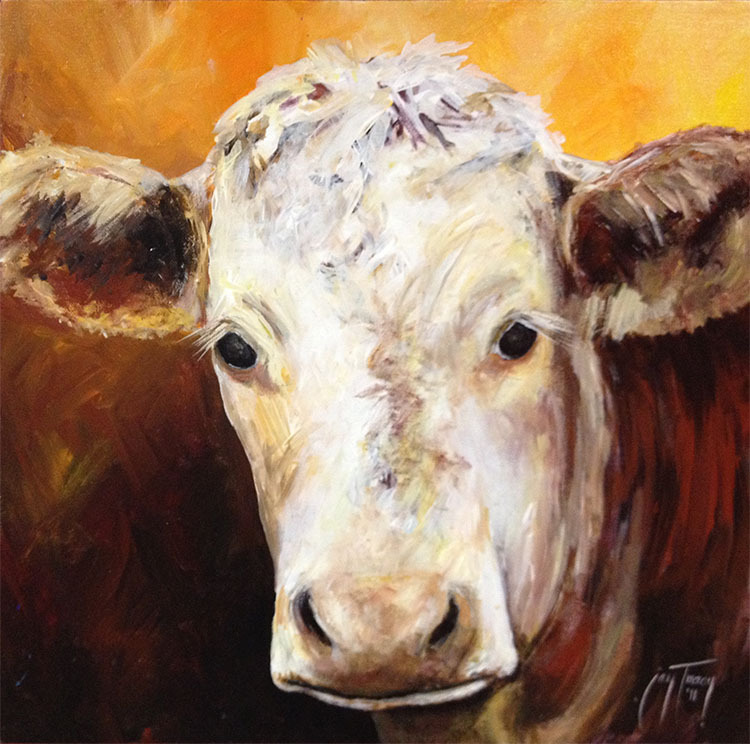 The birthing stall is in a quiet corridor away from the main flow of traffic. Keepers put burlap around the room so that Suriya would have complete privacy, except, that is, for a surveillance camera monitoring her every move. The goal for this first-time mom was to allow her to rely on her natural birthing behaviors, without human aid, unless necessary. Tigers have a track record of being difficult to breed. For three years, the keepers kept diligent records in an attempt to pair Suriya with the male, Raguna. Timing was crucial since the rare, week-long window of opportunity only comes once every three months. As part of the Tiger Species Survival Plan (SSP), the zoo had already determined a birth plan based on research and input from other professionals. Oklahoma City Zoo had another point in its favor—a staff with over five years experience at successfully breeding other cat species such as lions and snow leopards. On the morning of July 9th, a pleasant sight greeted the cat keepers. Camera monitors showed Suriya interacting with two cubs. She exhibited good mothering skills: licking, cleaning, nursing. All was well, so the staff followed their plan to stay away. What a surprise when a third cub arrived an hour later. And then a fourth another hour after that! These four tigers are an incredible contribution to the tiger species. Only 250 are left in the wild, and 66 live in accredited zoos. Now, the zoo population is up to 71! Fortunately, Suriya exhibited such good mothering skills that the keepers avoided all interactions with her and the cubs for over a week. Then, the noise of daily routine was added back in, and eventually the burlap was removed. After ten days, Holman offered Suriya food in a nearby stall, and the tiger followed her trained routine. She voluntarily shifted next door, allowing a gate to be closed between herself and her cubs. Veterinarians were able to do a well-baby check and take the newborns’ first weights, which were between four and five pounds. 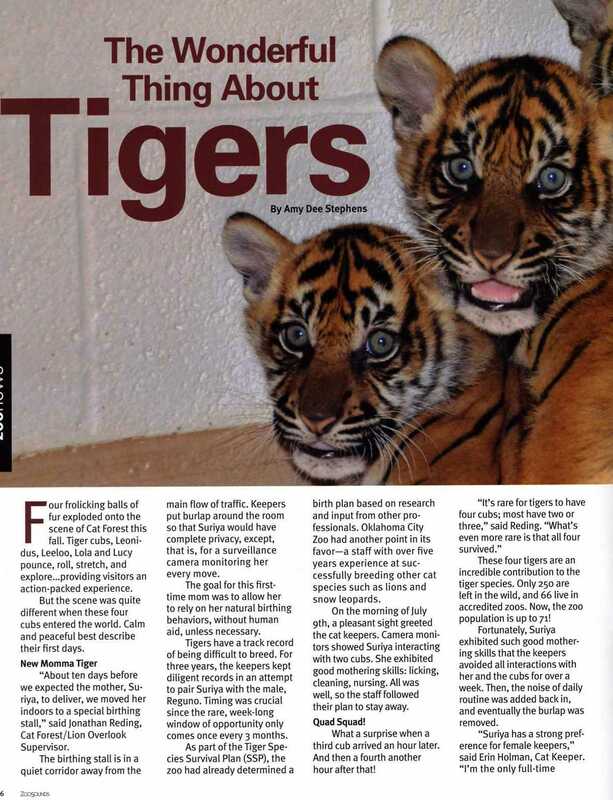 Since the cubs continued to do well after several months, the staff began preparations for the tigers to go on exhibit for the public by early fall. The first few days in the outdoor yard, the cubs jumped at every odd noise or visitor calling to them. Now, the four-month-old cubs are immune to zoo traffic. They perch confidently on their favorite overlook, keeping an instinctive eye out for prey as they pounce, roll, stretch and explore. Then, it’s time for a cat nap. “It’s play, play, play, but they are still babies, so they need lots of sleep,” said Reding. According to Holman, the cubs’ most active period is in the morning between 9:00 and 10:30. Each tiger has a unique stripe pattern, but to visitors, their personalities are the most obvious thing about them. Leonidus, the only male, is very laid back and gentle. He takes after his father and is expected to be a very large male. Leeloo is Leonidus’ running buddy. She is feisty and plays hard. Lucy has her mother’s personality, cautious and defensive. Lola is cautious at first, but then becomes adventurous. What is in the future for these tigers? 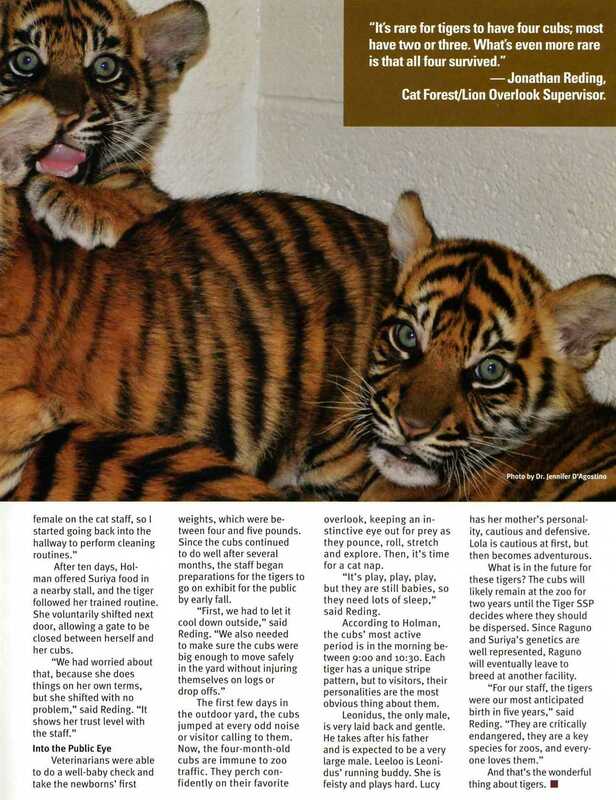 The cubs will likely remain at the zoo for two years until the Tiger SSP decides where they should be dispersed. 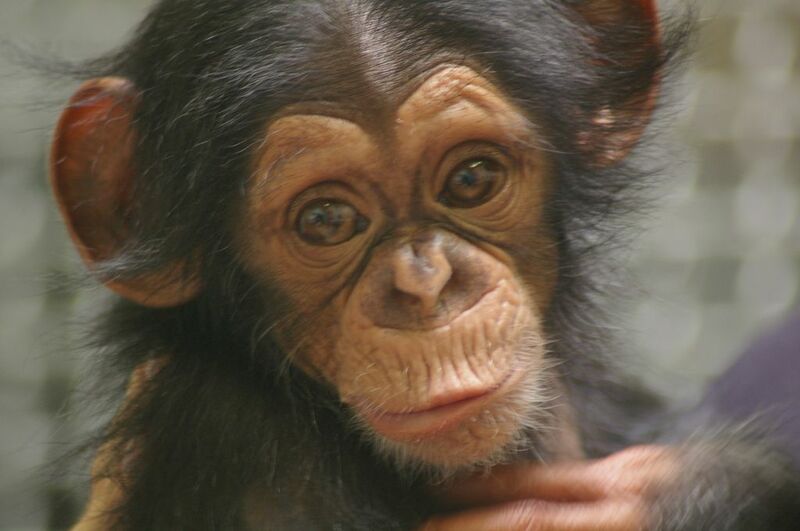 Since Raguno and Suriya’s genetics are well represented, Raguno will eventually leave to breed at another facility. And that’s the wonderful thing about tigers. Not only is Malee the zoo’s first baby elephant–everyone agrees that she is the cutest baby ever! The entire community claims her. Zoo attendance was nearly 150,000 over the former record for the past fiscal year. Thousands of people will whip out their cell phone to show you her pictures. Oklahoma is ga-ga about Malee. The healthy baby girl was born on April 15, 2011, with the lungs to prove it. 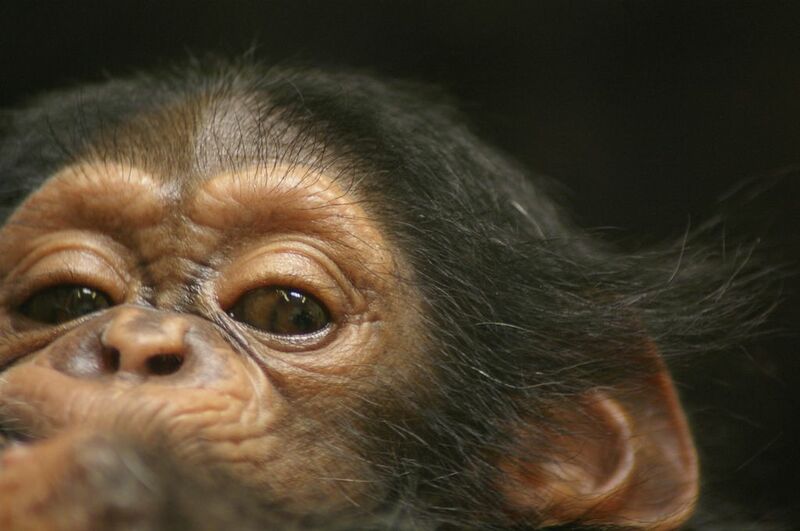 Human babies cry at birth, but keepers were stunned at how vocal Malee was—and how loud! She roared louder than her mom, Asha. Malee doesn’t have her trumpeting down yet, but she’s trying. Right now, it’s more of a squeak. But when she’s frustrated, she still bellows and roars. Malee definitely likes things done her way. The keepers say it’s hard to define her personality yet, but she might be a little headstrong. As a newborn, she didn’t want the keepers help—she wanted to get to Mom on her own, clumsy or not. Malee went outside when she was 2-weeks-old. Up until then, she’d stayed right next to Asha, but then she got caught up in the moment when Chandra, anxious to get outside, rushed on ahead. Malee went charging out with her Aunt before she realized that Mom had lagged behind. 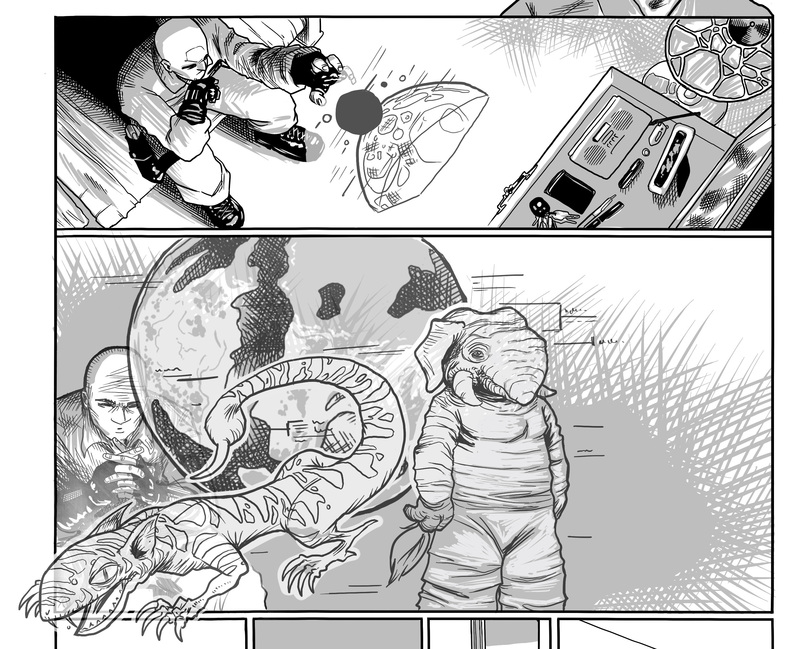 Now, Malee is exploring more. She ventures off, but Mom and Aunt are always watching. They correct her and keep her in line by gently pushing her with their trunk or feet. Some people think that Chandra is rough with the baby, but the keepers see that Chandra is a very protective playmate. She often rushes over to check on Malee if she senses trouble. At first, baby Malee wasn’t sure what to do with that trunk hanging on her face. She did use it to feel of her feet and a log on the first day, but it mostly flopped around. Now she’s trying to mimic the adults, who use their trunks to eat or give themselves dust baths. Keepers remember the day Malee managed to hold a piece of lettuce with her trunk. She started running around, waving it like a flag. Success! At 3-months, Malee could grip grass and put a grape in her mouth—even though it fell back out. She is now eating some solid foods, but will continue to nurse almost 2 years. Malee loves water. From day one, she enjoyed getting hosed off or having water squirted into her mouth. She stood on a rubber bath mat alone, but seemed reluctant to get into the blue and white inflatable pool, a gift from the Kirkpatrick Foundation. The keepers admit to crawling into the pool and splashing around, showing Malee what to do–to no avail. The water level in the outside pool has been slowly raised so that Malee can safely learn to swim. In mid-July, when the pool was at 4 ½ feet, Malee went completely underwater, kicked her feet, and popped back above water—her first swim. Malee will soon begin her formal training. She needs to learn her name and respond to cues. Malee already goes into her own stall for her bath—a nice step toward separating the elephants for individualized training. She is also comfortable with the keepers rubbing her skin and touching her, which is useful in doing health exams. Watching young Malee has been a treat for the keepers, who did much training and preparation to raise their first baby elephant. They view Malee as a member of their family and enjoy watching her grow and learn. The compare it to watching their own children grow up–except everything happens much more quickly with baby elephants than with humans! If you haven’t come to visit baby Malee yet, it’s not too late. Many “firsts” are still to come as she continues to learn. Maybe you will witness her first dust bath, or trumpet, or deep-water swim. If you do miss out—don’t worry. Plenty of Oklahomans will share their stories, pictures and videos with you. 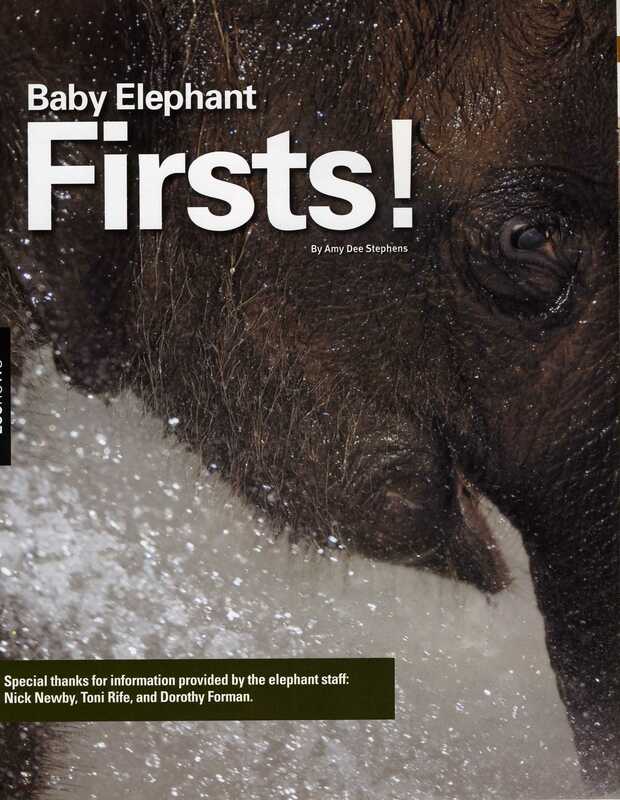 After all, Malee is the smartest, cutest, best-loved baby elephant Oklahomans have ever seen! Special thanks for information provided by the elephant staff: Nick Newby, Toni Rife, and Dorothy Forman.